This weekend I stopped at Home Depot to pick up a few supplies for our latest DIY adventure. I wandered to the garden center with hopes of picking up a new lemon tree and maybe a few new flowers for the garden. I was puzzled by a plastic label popping out of each of the plants. 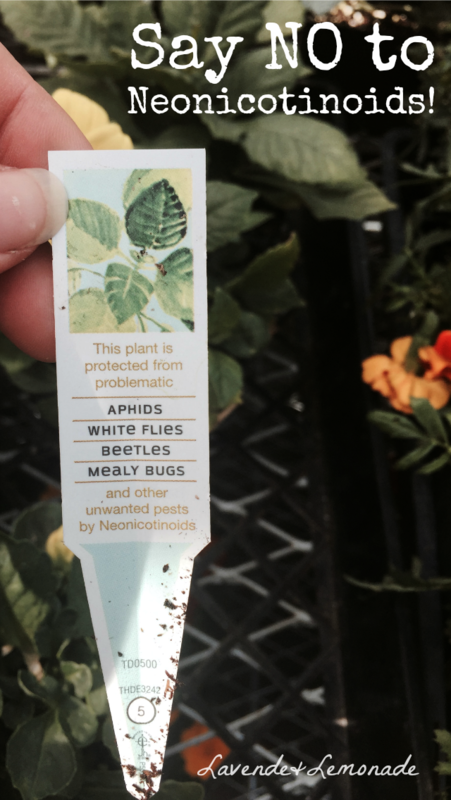 "This plant is protected from problematic Aphids, White flies, Beetles, Mealy Bugs and other unwanted pests by Neonicotinoids." That name sounded familiar...and why did their choice of wording sound like such a hard-sell? Like the waiter who comes asking 8 times if I'm really sure I don't want dessert. I've read up on the topic of Neonicotinoids, and its not pretty. They are a category of pesticide that affect the nervous system of insects. The pesticide is absorbed through the plants' root system, works its way through the plant, and usually finds its way into the nectar and pollen. Which is part of their danger - the pollen is where the "good" insects like butterflies and bees do their generous work. This category of pesticides has been strongly correlated to Colony Collapse Disorder (which destroys entire beehives in a matter of days), declines in butterflies, and even been traced into the birds that feed on the affected insects. Since the pesticide is usually applied through the soil, and only about 5% of it is absorbed, long-term soil contamination is also a major issue. Resident earthworms are affected, as well as our water sources, and the plants take years to come "clean" of the pesticides. Europe has already banned this category of pesticides due to their risk of far-reaching harm into the ecosystem, and The Harvard School of Public Health recently published this article further proving those suspected links between Neonicotinoids and bee scarcity. With all that research in place and environmental risks so great, why would a national home improvement brand encourage and promote their use? As it turns out, Home Depot has taken the action to at least be transparent about their use, though they're also silently being sold on plants from Lowe's and Walmart. By encouraging the average consumer to plant pretty but contaminated flowers in our home gardens, these stores are turning unsuspecting consumers like myself into unwitting butterfly, bird, and bird killers. 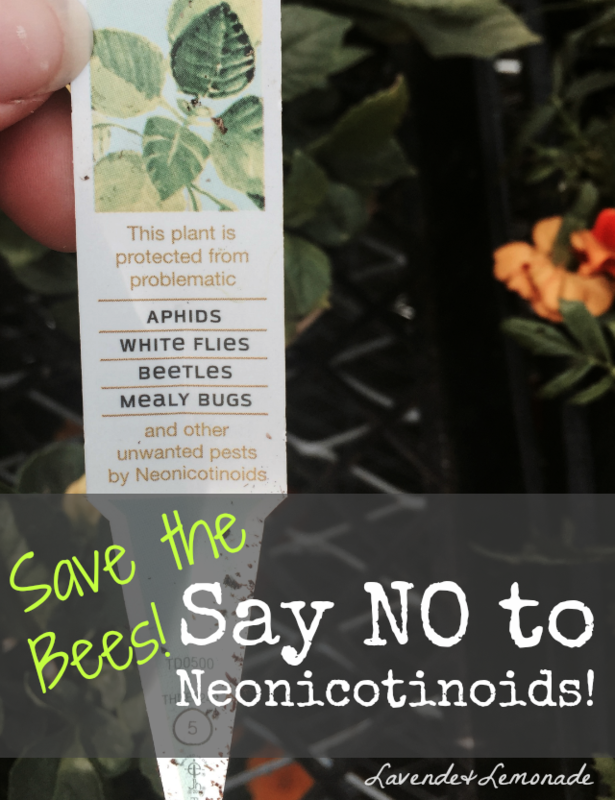 I encourage you all to follow me in asking Home Depot, Walmart, and Lowes to STOP promoting and using Neonicotinoids in their Garden Center plants. In my eyes this is highly irresponsible, and I'll be loudly boycotting Home Depot until I see change. With all the projects I have underway it will be a headache to go elsewhere, but I can't bring myself to support their decision to encourage such a dangerous product. Shop elsewhere, Tweet, and sign petitions like this one to help get national legislation in place to protect us. Honestly, are a few aphids on a new tomato plant worth the risk? I'll let the ladybugs take care of that. As Joni Mitchell sang..."Give me the spots on my apples, and leave me the birds and the bees - please"
Did you know these chemicals were on your new plants? What are your thoughts? 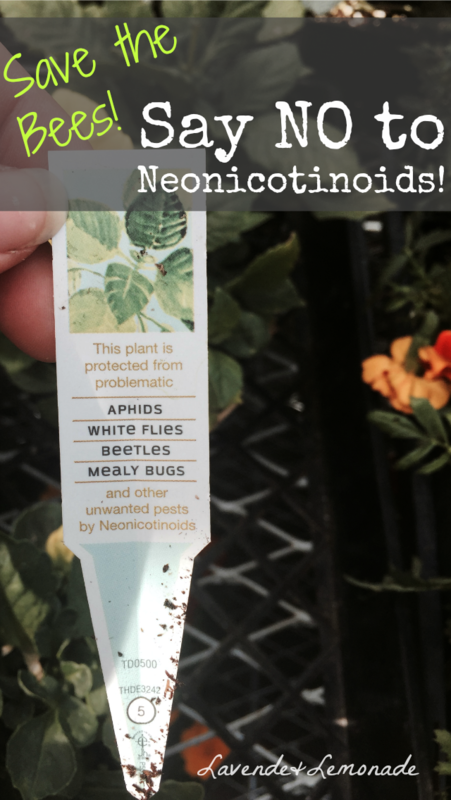 UPDATE: I've continued to research neonics, talk with my local nurseries, and feel this topic out. My stance has evolved a bit, and I've written about it at "Why I'm SOMETIMES Buying Plants at Home Depot...and How" - please check it out if you're interested in a bee-friendly yard! Above link is to report noting that Entomologists and other academic and scientific authorities find the research supposedly finding Neonics to be the cause of CCD to be seriously flawed and not meeting basic experimental standards. Why would someone argue for more chemicals in anything? There are other ways. Compost and rainwater and beneficial insects, etc. Balance and harmony. If the plants got a vote do you think they would pick a diet like the one the growing industry force feeds them? With well equipped production units and a state of the art research and development department, the Indian manufacturers upgrade their range continuously. I'm really impressed and motivated from your article. I'll not buy any plants from lowes. It is necessary to think of plants and the planet in general! I have read this post and if I could I wish to suggest you few interesting things or advice. Perhaps you could write next articles referring to this article. I desire to read even more things about it! delicatus home services Makes a list of the types of home cleaning service they are going to do when you call them. You've probably heard that you can make cheap 800 abroad using a relatively new technology called Voice Over Internet Protocol, or 'Voice over IP', or even 'VoIP'. But do you know about the multitude of other advantages of using VoIP to make international calls? There are various other ways to make 800 One of the most popular and the easiest ways to call international numbers free of cost is to use VoIP services. This is technology that uses internet to send voice messages. As it uses internet, you must be logged onto your PC with high speed internet. If the calling party is also using the same service like Skype, Yahoo messenger etc; the calls are completely free of cost. professional floor-care products I want to post a remark that "The substance of your post is amazing" Great work. A home improvement loan is actually one of the simplest ways in which you can live in your dream home. This is because it is the prime option for bob smith tools wanting to enhance the appearance of their home and also add to the value. In other words, a home improvement loan pays off in many ways. Home improvements have been shown to significantly increase the value of property, make homes a safer place for children and improve the quality of life for everyone in the home. Contacting a robert is a vital first step for you to make your home happen, really learn more about Home Improvement services and make yourself at home.